Sunshower Farms | Kona Coffee Farm and Event Venue — Our First Event! 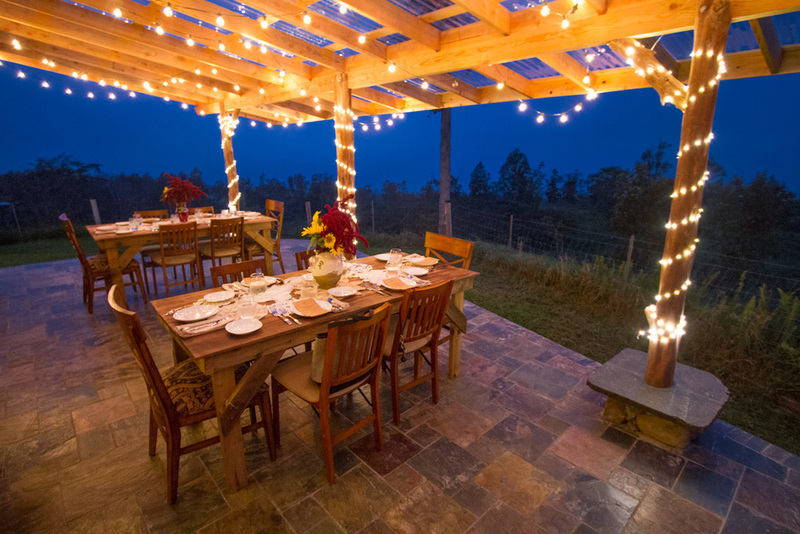 We hosted a farm-to-table dinner (hopefully the first of many)! It has been a goal since we started our farm to host events where everything (or nearly everything) is sourced from our own farm and it feels really good to have our first dinner under our belts. Our first menu was a "rustic Italian" which was really just a fancy way of saying homecooked style italian that was plated family style. Going forward we plan to have different chefs visit the farm to do a menu and style of their choosing. But for this first dinner, myself and my friend Aaron did all of the cooking so we wanted to focus on simple, crowd pleasing food. * indicates that the item was sourced from another local farm. Speaking of Aaron, he and his girlfriend Emily (my old friends from Augustana) were visiting and helped immensely with this first dinner - we literally could not have done it without them. Aaron works at a restaurant in Geneva, IL where he tastes and recommends a lot of nice wines, so he picked all of our pairings. He also single-handedly made the braised goat shank dish and the tiramisu. With the help of Slow Food Hawaii, we easily sold 11 of our 12 seats. This actually worked out perfectly because I had been worried about getting some nice pictures of the event. So with our last seat, we decided to look for a photographer who would be interested in trading the dinner for some photos of our space and the food. We were incredibly fortunate to find Anya Vaverko through a friend, and although she is a photo journalist by trade, I think it's clear that she could have a second career in food photography too! All of her pictures turned out so beautifully that we feel like we certainly got the better end of the deal. For our next dinner, we are cashing in on our good taste in friends once again by having Kyle Bart as the guest chef. He and his wife Niccole are also our good friends from Augustana and Kyle just happens to be an excellent Chef in NYC and will be visiting in early April. If you are interested in reserving a spot at his dinner, you can check out the menu here. Also, any chefs reading this who would like to do an event at the farm, please let me know!